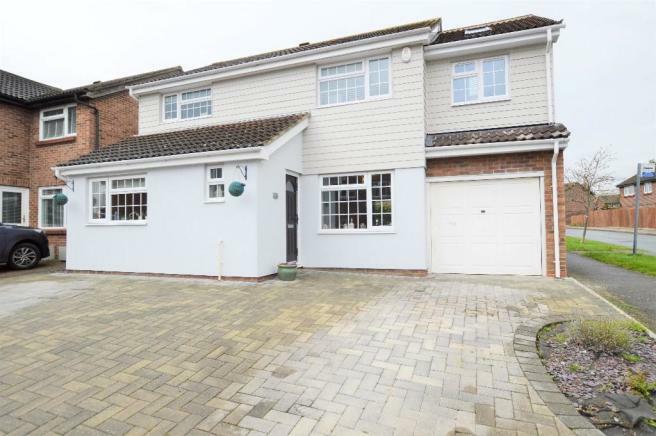 We are pleased to offer for sale this superbly presented Four bedroom detached family home, which is located within a prime residential area. This lovely property offers spacious accommodation throughout to include: A good sized hallway, ground floor cloakroom, large garden aspect lounge with French doors on to the rear garden, dining room also with French doors, and a huge modern kitchen. On the first floor are four good sized bedrooms, the second having a lovely vaulted ceiling with Velux windows, and a modern family bathroom suite. Outside offers a fully enclosed and good sized rear garden which is mainly laid to lawn, a large garden shed/office with power, light. To the front you have your own private block paved driveway providing parking for three vehicles and an attached single garage. This is a fantastic property and must be seen. Sole Agent. Ground Floor Cloakroom - Front aspect frosted double glazed window, vanity unit with inset sink, mixer tap, half tiled walls, low level wc, heated towel rail. 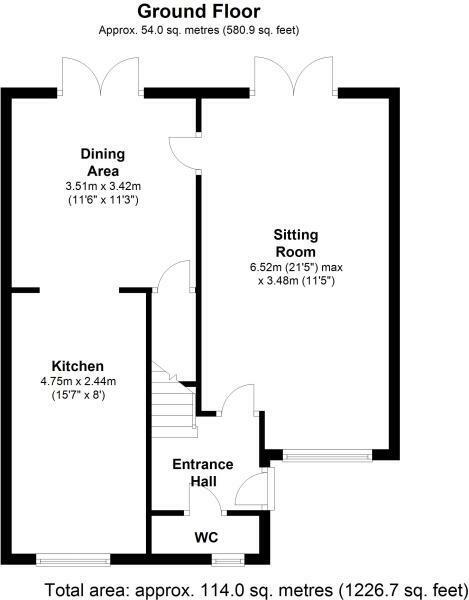 Large Kitchen- 15'7 x 8' (4.7m x 2.4m) - Front aspect double glazed window, 1 ½ bowl enameled single drain sink unit with mixer tap, wooden work surface, cupboard and drawers below, space and plumbing for dish washer, space for large cooker, eye level cupboards, extractor hood, two ceiling light points, storage cupboard, tiled flooring. Bedroom One - 11'6 x 9' (3.5m x 2.7m) - Front aspect double glazed window, radiator, built in double wardrobe, ceiling light point. 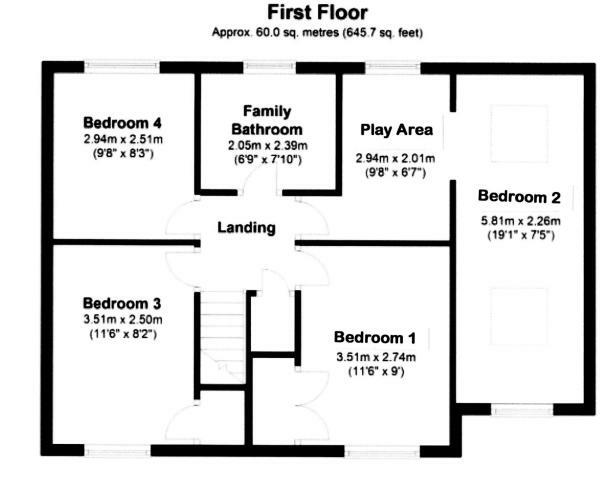 Bedroom Two- 19'1 x 7'5 (5.8m x 2.2m) - Plus Play Area 9'8 x 6'7 (2.9m x 2m) Front and rear aspect double glazed window, L shaped room, two Velux windows, built in cupboard, TV point. Bedroom Three 11'6 x 8'2 (3.5m x 2.7m) - Front aspect double glazed window, radiator, built in cupboard, TV point. Bedroom Four - 9'8 x 8'3 (2.9m x 2.5m) - Rear aspect double glazed window, radiator, power point. Bathroom - Rear aspect frosted double glazed window, low level wc, wall mounted wash hand basin with mixer tap, panel enclosed bath with mixer tap, rain shower head, part tiled walls, heated towel rail, spot lighting. Fully enclosed Rear Garden - Side access to front, paved patio steps up to main garden, laid to lawn, central paved patio to large storage shed/office includes power and light, electric heating and double glazed windows. Private driveway providing parking for 3 to 4 cars. Fisher Close, is a superbly presented four bedroom detached family house which is offered to the market in impeccable condition throughout. To fully appreciate its size and condition an internal viewing is a must by appointment only. Sole Agent. Disclaimer - Property reference FCLOSE. The information displayed about this property comprises a property advertisement. Rightmove.co.uk makes no warranty as to the accuracy or completeness of the advertisement or any linked or associated information, and Rightmove has no control over the content. This property advertisement does not constitute property particulars. The information is provided and maintained by Bourne Estates, Haverhill. Please contact the selling agent or developer directly to obtain any information which may be available under the terms of The Energy Performance of Buildings (Certificates and Inspections) (England and Wales) Regulations 2007 or the Home Report if in relation to a residential property in Scotland.